Manufactured By – Warner Music Philippines Inc. 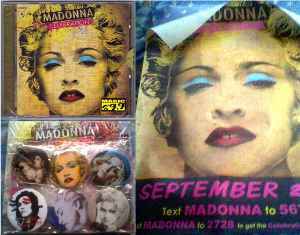 Distributed By – Warner Music Philippines Inc.
Special Limited Promo Package Set of Madonna's "Celebration" which includes the Deluxe 2CD Set of the album + 2DVD Digipack Video Collection + 6pcs Promotional Celebration Buttons Set + 18" X 24" Promo Poster in one package. This set was only given away to early lucky buyers of both releases. Also includes the Warner Music Philippines Promo Sampler 2009 Volume 05 with Madonna on cover in promotion for her Greatest Hits album, "Celebration". Note: the Celebration 2CD Deluxe album release has no barcode as issued.